Total weight gain: 24lbs, turning in to a fatty! Best moment this week: Spent a lovely couple of days with my mother-in-law, despite the rubbish weather! Also, my greenhouse has arrived, but it’s just sat in the garage at the moment waiting for us to put it together. It’s been really nice spending a couple of days at the allotment, (Chris) got the potatoes planted, and did a load of weeding. Movement: She’s a right fidget bum, doesn’t stop squirming. Have noticed that there are definitely less kicks these days, probably cos she doesn’t have room for that anymore, only room to wiggle about! Labour Signs: None yet. I’m hoping she decides to hold off until after I’ve finished everything on my to-do list for tidying/cleaning the house. Plus I have various requests from people saying she’s not allowed to arrive during certain dates due to being out the country, away for the weekend, having interviews etc…. I’ll see what I can plan for you guys!! 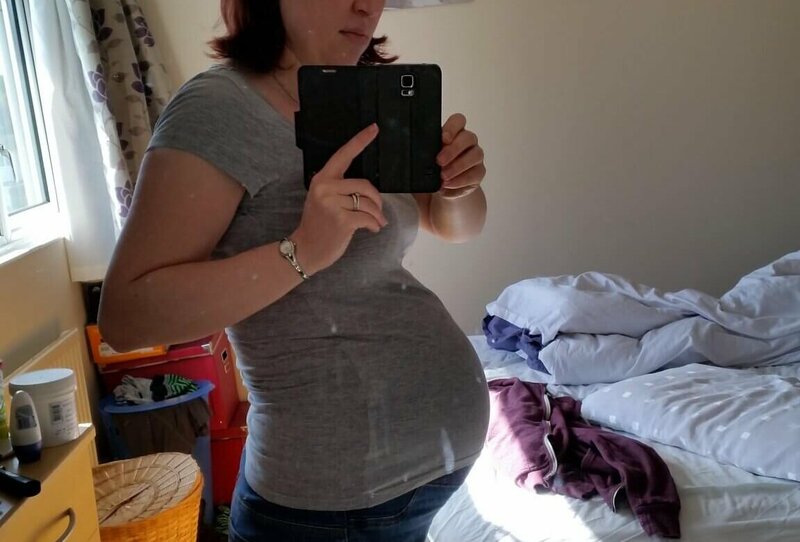 Symptoms: Pretty much the same as last week really – feeling constantly exhausted, but being unable to sleep, needing to pee lots, heartburn, not being able to get comfortable when lying in bed, getting very uncomfortable when a certain someone decides it’s a great time to fidget loads! I thought heartburn was meant to decrease once she’d dropped, turns out not!! Though I guess it’s not quite as horrific as it has been, but still not fun! Wedding rings on or off? On, not nearly as loose as they used to be, less chance of them falling off now. 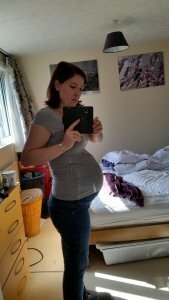 Looking forward to: Finally reaching my due date in less than 6 days now! Spare bed is getting delivered tomorrow, which means that once we have put that together Blueberry is free to arrive as we’ve got everything done we wanted before she arrived. I even finally packed my hospital bag yesterday! Look who’s a fatty bum bum! Your bump is so cute! Very excited for you!! !